Many bike shops in Guilin offer mountain bike rental services, yet there are not many choices as most of the bikes are very basic with poor parts and seldom maintained. Travelers can find those bicycle shops on side roads around the Revolution Bridge (Jiefang Bridge), and the back door/side door of the universities. Usually people need to mortgage ID cards/Passport as a deposit for bike renting (some less important documents like driving license is possibly to be rejected in some shops). If they do not want to do that, a certain amount of cash needs to be kept. The deposit amount depends on the bike level you have borrowed, e.g. you may need to pay RMB500-800 Yuan for a bike that is worth around RMB 1200. Most of the sales men in the shops do not speak English! Test the bikes before departure for your safety. You’re discouraged to rent unfamiliar bikes as you may not be able to control it well (about its gear changing, parking, etc.) Always keep the bikes with you and don’t rely on locks. The locks are nothing important when a thief wants to walk off with it! Lock the bikes on iron bars or something rooted inside the ground (trees, streetlights, etc.) proving you have to leave them. The highlight scenery in Guilin is with water (rivers, lakes, etc.). So wherever you see rivers, that might be a good choice to ride follow it, especially the areas where Li river passing through. 1. The river bank section of Yushan Bridge (虞山桥) to Nanzhou Bridge (南洲大桥) (down to the river bank will be awesome ), it's close to the Yushan Park in the north. 2. The river bank section of Jingpingshan Bridge (净瓶山大桥) to Lijiang Bridge (漓江大桥) will takes you into the Chuanshan Park (穿山公园) for free! (Road on this section is being rebuilt but the scenery is cool! Always follow the river bank, you will find peaceful villages with primitive local cultures. 4. The lakes and rivers of the city center are also available for cycling. 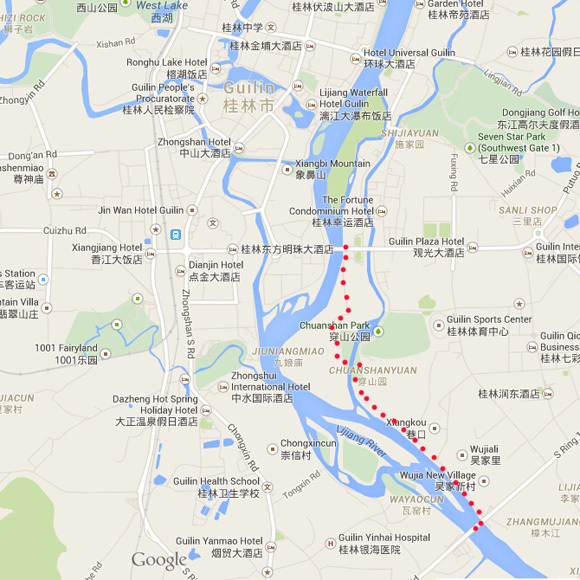 You can find them close to the Guilin Middle School (桂林中学) on the map. Keep away from the crowd, talk to your soul in such an awesome place! The red lines show the city highlight cycling routes. Yangshuo is getting more and more famous and has attracted thousands of world travelers every year. 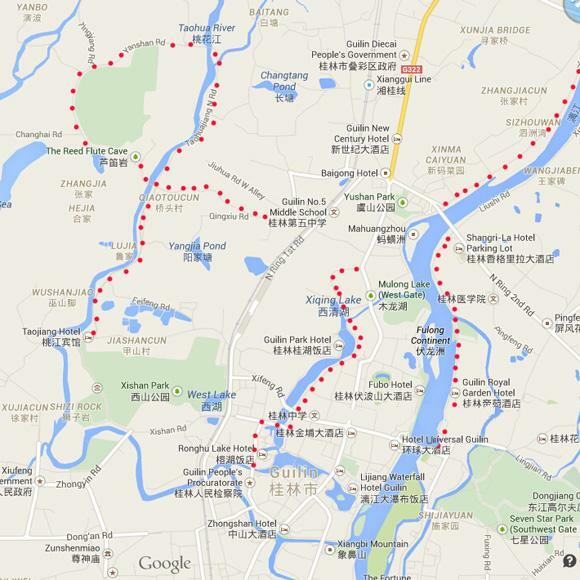 The former peaceful town now has become a settlement for foreigners of Guilin. It is quite easy to rent a bicycle in Yangshuo as the town is now very popular among cyclists. For leisure cycling, Tandem bicycles can be rented everywhere around Yangshuo. The booming domestic tourism in China has improved many natives’ living conditions; they built viewing decks, restaurants and lovely guesthouses on the key points along the Li River. However, the increasing of tourists also killed many pure cycling routes. Biking on the main roads around Yangshuo now is not as pleasant as before. 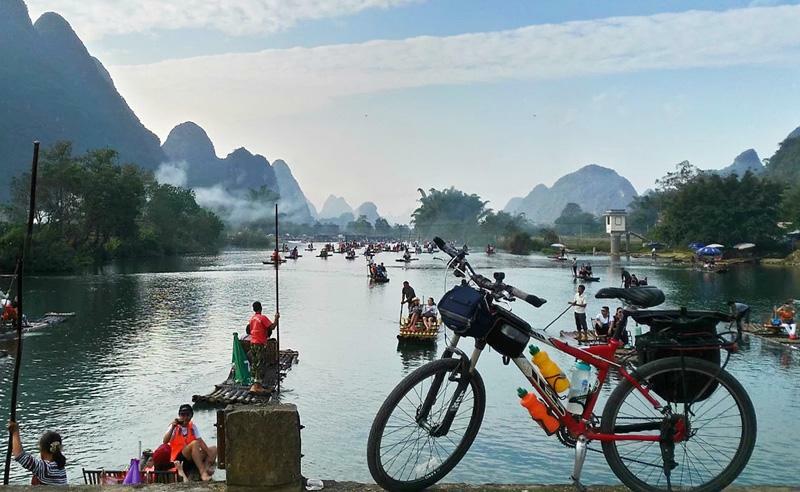 However, we can bike to somewhere less crowded and venture into the primitive rural areas to have an in-depth experience of Yangshuo local life. Here is some routes worth for biking (45-70KM). 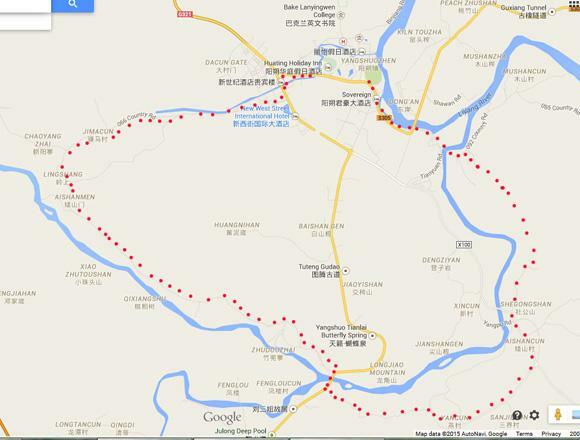 1.Country roads by bike from Yangshuo to Jiuxian (旧县, also called the old county of Yangshuo), then continue biking by country roads along the Yulong bridge and get to Baisha, then find turnings to the Yulong Bridge, riders will pass through a village called Guanqiao Cun (观桥村). The whole trip has nothing to do with the national road of G321, you might be on the wrong way if you find it. You can go back to Yangshuo from the national road if you do not want to cycle back on the same road. 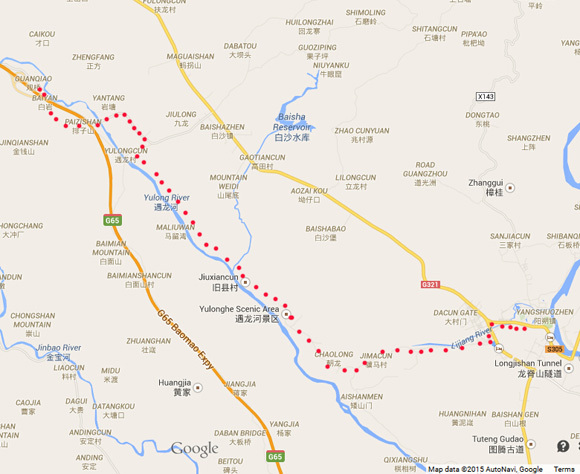 2.Bike from the X143 county road from the north to Guban village (古板村), then go on cycling to Xingping town. (Ferry boats are available when you arrive in Xingping, travelers can choose hotels on both sides of the river, but if you cycle back to Yangshuo from the eastern bank of Li River, you may need to cross the river first). You also have an optional biking to Putao, and then find the national road of G321 back to Yangshuo. 3.Find Jima village (骥马村) in the southwest of Yangshuo and the Gongnong Bridge on the national road (a visit of the Moon Hill or Big Banyan Tree is available during the biking trip), then continue biking through the eastern paths to Aishan village (矮山村),then back to Yangshuo. 4.Same route as the 1st one but visit Langzi village (朗梓村), it is in the southeast of Yulong Bridge, then follow the National road or the road to Aishan village mentioned in 3rd route back to Yangshuo.